Texas populist gadfly Jim Hightower at the studios of KOOP-FM in Austin, Texas, September 13, 2013. Photos by Roger Baker / The Rag Blog. In 30 years, we’ve gone from Ronald Reagan’s ‘trickle-down’ to the Koch Brothers’ ‘tinkle down’ economics. We are resurrecting the robber barons and imposing a plutocracy over our democracy. Texas populist writer, commentator, and political gadfly Jim Hightower was our guest on Rag Radio, Friday, September 13, 2013. 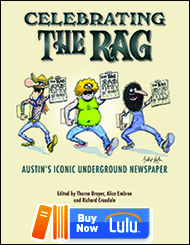 Rag Radio with Thorne Dreyer is a weekly syndicated radio program recorded at the studios of KOOP 91.7-FM, a cooperatively-run all-volunteer community radio station in Austin, Texas. Texas progressive populist writer, public speaker, humorist, radio commentator, and political gadfly Jim Hightower was twice elected Texas Agriculture Commissioner and is a former editor of the Texas Observer. He is the New York Times best-selling author of seven books including Swim Against The Current: Even A Dead Fish Can Go With The Flow; Thieves In High Places: They’ve Stolen Our Country And It’s Time To Take It Back; If the Gods Had Meant Us To Vote They Would Have Given Us Candidates; and There’s Nothing In the Middle Of the Road But Yellow Stripes and Dead Armadillos. Jim Hightower broadcasts daily radio commentaries that are carried on more than 150 commercial and public stations, on the web, and on Radio for Peace International. He publishes a populist political newsletter, The Hightower Lowdown, which now has more than 135,000 subscribers, is the fastest growing political publication in America, and has received both the Alternative Press Award and the Independent Press Association Award for best national newsletter. His newspaper column is distributed nationally by Creators Syndicate. We do have some strong progressive media, he said, citing the country’s numerous independent community radio stations, many of which air Hightower’s commentary — with special praise for Austin’s KOOP and Rag Radio — and the Texas Observer. “And we’ve got voices like Rachel Maddow and Paul Krugman,” he said. On the show, Jim talked about the recent “flapdoodle” in the Texas legislature over abortion and women’s health that drew thousands of activists to the Texas Capitol and was highlighted by State Sen. Wendy Davis’ remarkable filibuster. According to Hightower, Lt. Gov. Dewhurst (“he’s such a prissy guy anyway, a multi-millionaire public servant who doesn’t like the public…) got spooked by all the women in the State Capitol building. Dewhurst “had heard that they were going to bring tampons and other ‘feminine projectiles’ into the Senate chamber, to toss down on the floor,” Jim says. So he had the state troopers search ladies’ purses at the Capitol entrances and confiscate anything resembling a tampon. Whether or not Wendy Davis runs for governor, Hightower believes that real change is in the works for Texas politics. The long-dormant state Democratic Party is alive and kicking, he says, under the “vigorous and vibrant” leadership of new party chair Gilberto Hinojosa, who is committed to returning the party to grassroots organizing. The Texas Democrats “got way too cozy with the lobbyists and with the money,” Jim says. “We had people sitting in the office down by the Capitol, just talking to each other.” Now the party has 20 organizers working in the field. 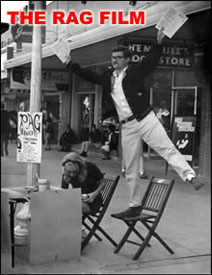 From left, Rag Radio host Thorne Dreyer, populist commentator Jim Hightower, and Rag Radio’s Tracey Schulz. “Snowden, to me, has done a tremendous public service by revealing all this,” Jim said. Also read “Jim Hightower and the ‘Populist Moment’” on The Rag Blog from April 11, 2012, and listen to our earlier Rag Radio interview with Jim Hightower here. 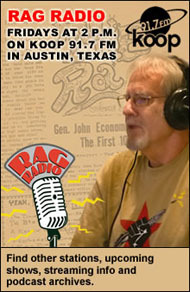 Rag Radio is hosted and produced by Rag Blog editor Thorne Dreyer; Tracey Schulz is the show’s engineer and co-producer. Rag Radio has aired since September 2009 on KOOP 91.7-FM, an all-volunteer cooperatively-run community radio station in Austin, Texas. Rag Radio is broadcast live every Friday from 2-3 p.m. (CDT) on KOOP and is rebroadcast on Sundays at 10 a.m. (EDT) on WFTE, 90.3-FM in Mt. Cobb, PA, and 105.7-FM in Scranton, PA. Rag Radio is now also aired on KPFT-HD3 90.1 — Pacifica radio in Houston — on Wednesdays at 1 p.m. THIS FRIDAY, September 27, 2013: In their first father/daughter interview, newsman Dan Rather and Austin-based environmentalist Robin Rather. Friday, October 4, 2013: Novelist Thomas Zigal, author of Many Rivers to Cross, set in post-Katrina New Orleans. This entry was posted in RagBlog and tagged Abortion Rights, Jim Hightower, National Security Agency, Poopgate, Populism, Privacy, Rag Bloggers, Rag Radio, Rick Perry, Texas Politics, Thorne Dreyer, Trans-Pacific Partnership, Wendy Davis, Women's Health. Bookmark the permalink.